Unless you know how to make mixed drinks off the top of your head, find recipes for theme party cocktails that fit the theme of your party and are easy to make. The last thing you want to do is create more work for yourself during the event by offering complicated recipe options. You may want to spend some time learning how to make them before the big event. A fun way to do that is to invite some of your closest friends over for a pre-party tasting. Pick out a few recipes, or create some of your own, and then let everyone taste test them. Find out which ones are the most popular mixed drinks among the group and serve those at your bash. In addition to offering easy to make party cocktails, limit the options to 1 to 3 drinks max and have those ingredients available so the drinks can be quickly mixed and served. Create a menu card with the cocktail names and ingredients so guests can choose a cocktail and you or your bartender can easily mix them. To save even more time, pre-mix them and serve them in a punch bowl or from pitchers. Certain recipes are better than others for this option. We put together a few pages where you can find all sorts of popular mixed drinks. Most have under 5 ingredients and all are easy to make. Several Easy Martini Recipes can be found here including a Mexican Martini mixed with homemade sour mix. Creamsicle, pineapple and strawberry too. Some of our Best Martini Recipes are included here. A Dirty Vodka Martini as well as some of the new age flavors like a Pomegranate Martini recipe. Looking for recipes for cocktails with Kahlua? Learn how to make this beloved coffee liqueur plus find a coffee martini recipe and several other mixed drinks with Kahlua. Perfect for dinner parties. Several Irish drinks including the Buttery Irishman and the Peppermint Patty cocktails and a couple of Irish whiskey recipes. Consider some of these mixed drinks for your St Patricks Day theme bash. One could argue that these five 70s and 80s Cocktails were the most popular during that time. Find pictures and recipes to use for your next seventies or eighties theme party. Guests appreciate warm holiday drinks especially when it is cold outside. Learn how to set up a coffee bar for entertaining and find recipes for warm cocktails. For home parties, garnishing cocktails is a must. Garnishes not only dress up your bar by adding color but they also transform boring cocktails into masterpieces. Learn what to include on your home bar. 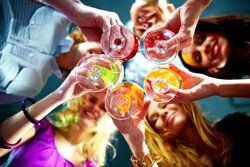 What fun party drinks should you offer your guests? All sorts of ideas for alcohol and non-alcohol beverages to serve at your next theme party. This one-page cocktail ideas menu makes it easy for your guests to choose a cocktail and for you to make it when it is displayed on your home bar. Includes 12 Specialty Martinis and 8 other cocktail recommendations.